But how do we get our wee little kiddies to love you like we do? Few children can see the stellar qualities you bring. Especially raw when you tend to be a tad too gritty. 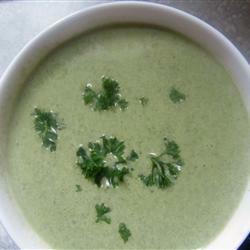 Now, I have found a way to get my lil’ princess to enjoy your goodness – cream of spinach soup. I have no idea why I haven’t ever tried this before but finally I have and it’s an easy, quick supper when paired with a whole grain bread and perhaps some cheese if you are the cheese eating type (or the bread eating type for that matter.) A side salad doesn’t hurt either. Get them veggies in ya! Another thing I like is the price of the meal. Relatively cheap as most of the ingredients we generally already have. A bag of spinach runs between two to three dollars and you can easily feed a family of four with this – or get three meals out of it for a family of two. Boil water, spinach, bouillon and garlic until spinach is soft. In a big sauce / soup pot make a roux (melt butter, then slowly whisk in flour to make a creamy paste) then slowly whisk in milk. Season with salt and pepper (and dried minced onion if you like, i didn’t but next time I might try adding chopped onion to the spinach mix) then cook until thickened. Add spinach mixture, puree with hand blended or whatever else you want. Then serve and enjoy. You can garnish with dribbles of sour cream or plain yogurt if you wish. Or parsley. Princess D’ definitely liked it. Ate half her serving and I think would have eaten a bit more if it wasn’t so creamy. It was so creamy it was really filling. Yums from her 3.5 out of 5. A definite addition to the Mommy-Needs-A-Meal-Quick book. This entry was posted in Healthy Habits, Recipes and tagged easy meals, eating healthy, healthy meals for kids, kid approved meals, nutrition and kids by njsullivan. Bookmark the permalink.